With 52,000 km2 the Central Kalahari Game Reserve is the world‘s second largest protected area and one of the most remote and pristine in Africa. Nothing prepares you for the immensity of this reserve, nor its wild, mysterious beauty. One has a strong impression of unending space and having the entire reserve to oneself. The game reserve is unique as it was originally established in 1961 with the intention of serving as a place of sanctuary for the Bushmen, or San, in the heart of the Kalahari where they could live their traditional hunter/gatherer way of life without intrusion or malign influence from the outside world. Originally, the reserve was closed and only opened for tourism in the 1980s. Today there are still some small, remote Bushmen villages within the reserve which cannot be visited by tourists. The Central Kalahari Game Reserve is characterised by dense bush containing Kalahari acacia trees and Kalahari apple-leaf, interspersed with open saltpans and grasslands and dotted with occasional sand dunes. The reserve is famous for its ancient fossil river beds which form valleys through the bush, of which Deception Valley is the most famous. Generally, the Kalahari is not the place to see large herds of animals, but is rather a place for a high diversity of highly-specialized desert species. Gemsbok (oryx) and springbok are mainly seen, but also smaller herds of hartebeest, eland, wildebeest, giraffe, kudu and ostrich. The selection of predators is very diverse including the famous black-maned Kalahari lion, leopard, cheetah, African wild dog, brown hyena, caracal, African wildcat, black-backed jackal, bat-eared fox and Cape fox. The adaptability of the different desert species becomes apparent during the extremely dry winter months. Many species can survive long stretches of time without water, have special physical adaptations and/or split their herds into smaller splinter groups to search the Kalahari for food. Game viewing in the Central Kalahari Game Reserve is best during and shortly after good summer rains in the rainy season (November to March) as the harsh landscape turns into a flourishing paradise and rainwater accumulates in seasonal waterholes on the pans. Thousands of antelopes can be seen in the lush grazing areas, closely followed by hungry predators such as the elusive brown hyena, often seen around campsites after dark. The sunset during this time of the year reveals a red fireball which is seen behind scattered acacia trees in a classic postcard image. 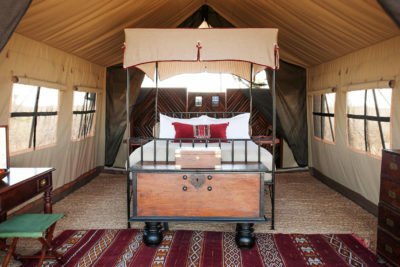 The unique experience of travelling through truly untouched wilderness of seemingly unending dimensions is the biggest draw to the Kalahari environment.